I love cabbage rolls, whether rolled or deconstructed , but regular sized ones  are a bit too large and sloppy in my mind to put into all but the largest bento boxes. 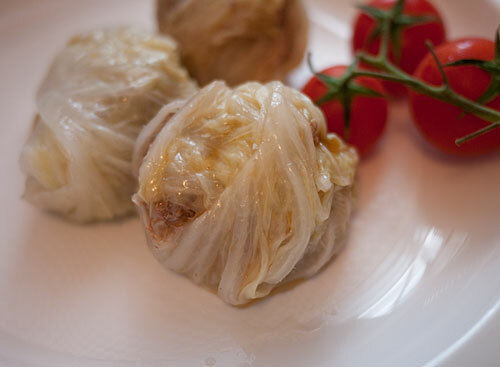 These are little bento sized cabbage rolls, just a bit bigger than a ping-pong ball. They aren’t too showy to look at, but are deliciously juicy hot or cold. 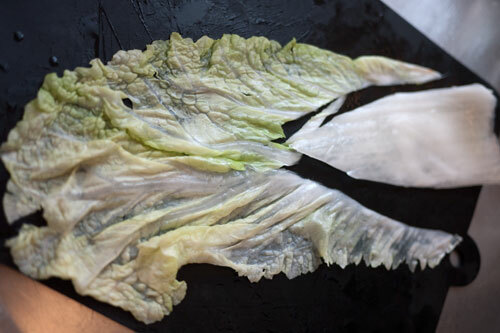 They are kept compact and slim by using napa or Chinese cabbage instead of regular cabbage leaves, since napa cabbage leaves are thinner and more tender, and using the smaller inner leaves that are about 10 inches (25cm) long. 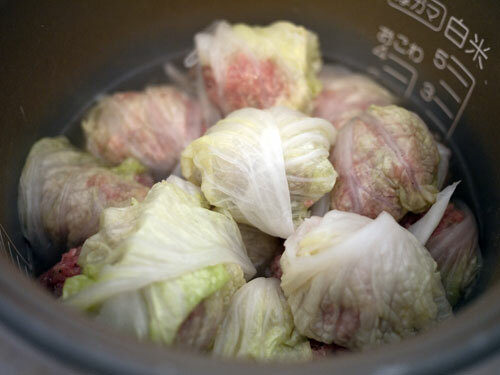 Another feature of these mini cabbage rolls is that I tried making them in a rice cooker, and they came out great. I’ve also given instructions for making them on the stovetop, but if you’re looking for more ways to utilize your rice cooker, you may want to try it out that way. 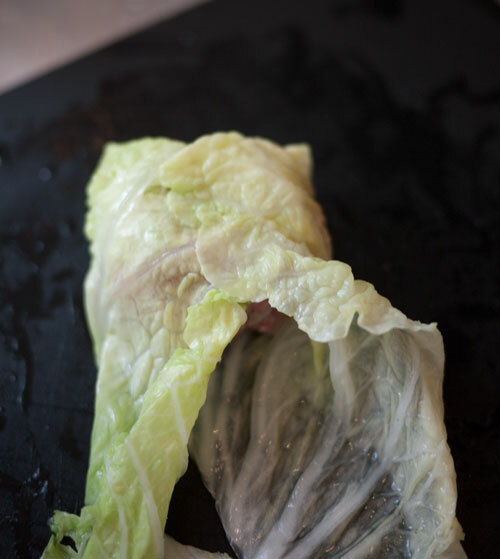 These little cabbage rolls freeze beautifully, which is why I’ve put them in the Johbisai/staples section . Despite their meaty taste, they are fairly low in calories since they contain all of the chopped up stem parts of the cabbage leaves. 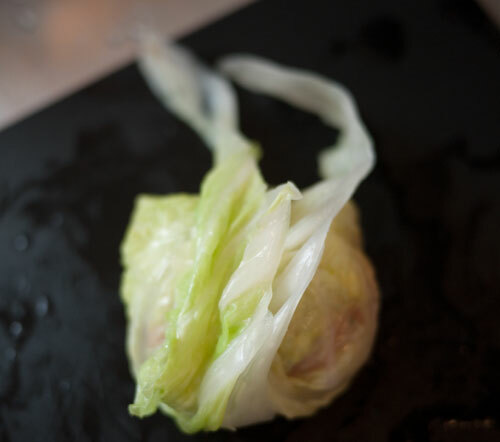 Put the washed napa cabbage leaves in a pot and cover with water. Bring up to a boil, then turn the heat off. Leave to cool, then take the limp leaves out and squeeze them out. Alternatively, put the leaves on a plate and cover with plastic wrap, and microwave for 7 minutes until the leaves are limp. Leave to cool, then squeeze out the moisture. Take each leaf and spread it out, and cut out the stem part. You’ll be left with a leaf with an inverted V shape cut out of it. Set the leaves aside, and chop up the stems finely. Squeeze out any excess moisture from the chopped up stems. Put all the ingredients, except for the set-aside leaves and the stock, into a bowl and mix together well with your hands. Form into 12 balls. Now to start rolling. Put a leaf in your work surface, and put a golf ball sized meatball on the leafy end. 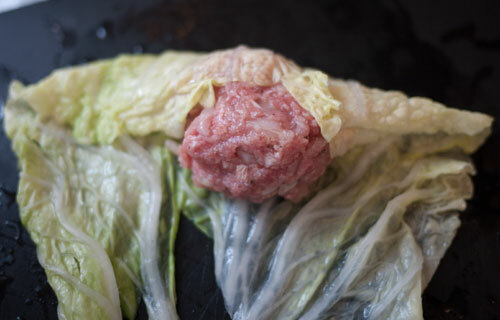 Wrap the end of the leaf over the meatball. Wrap the two sides over the meatball. Bring the tail ends of the leaf up and over the meatball. Tuck the ends under. 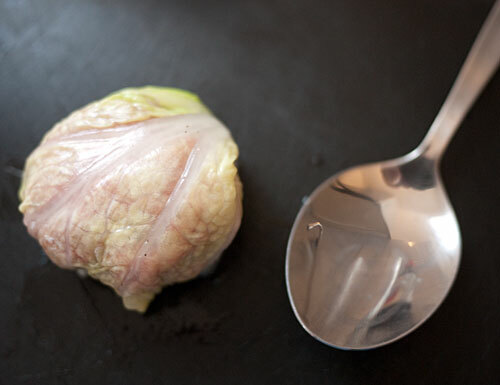 Here’s one completed cabbage roll (or cabbage ball…), next to a tablespoon for size comparison. If you’re using a rice cooker: Put the soup stock in the inner bowl. (Note that if you use dashi stock the cabbage rolls will taste more Japanese, but regular soup stock is fine too.) Put the cabbage rolls, seam side down, in the bowl. You can pile them right in, like so. Close the lid, and set the rice cooker to cook. Note that I used a 5-cup Zojirushi rice cooker for this, similar to this one  but about 20 years old! If your rice cooker is larger or smaller, cooking times may vary (if you have a small rice cooker with a loose lid, watch out for boil overs; you might want to use the stovetop method instead, or cook the cabbage rolls in two batches). I just switched it on and left it until the cooking cycle stopped. The rolls should cook for at least 20 minutes, or until the rolls feel firm when you poke them. Cooking them for a bit longer doesn’t harm them at all - they just get more tasty. If you’re cooking them on a stovetop: Use a pan that is large enough to allow the rolls to be placed in a single layer, and has a tight fitting lid. Put in the stock, and add the cabbage rolls. Bring up to a boil, then lower the heat so that it’s just simmering. Put on a lid, and let simmer for 40 minutes. To use in a bento, drain off the excess liquid well. They can be eaten at room temperature, or heated up for a couple of minutes in the microwave. To freeze these, put in a freezer-safe and microwave-safe container with a little of the cooking liquid. They’ll keep in the freezer for about a month. Footnote: I have to admit that I haven’t been doing a whole lot of cooking of any kind in the last few weeks, what with having surgery, the hospital stay, the house still in a mess, and other large and small annoyances. But I’m slowly getting my cooking and bento-oing mojo back!